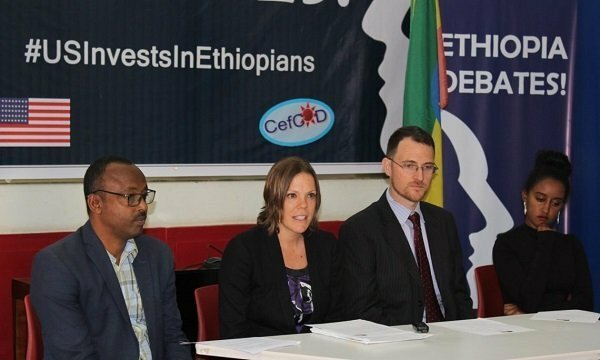 The U.S. Embassy is pleased to launch Ethiopia Debates! Ethiopia Debates! is a nationwide program that creates an interactive platform for university students to engage in a series of debate competitions, during which they learn public speaking skills, and constructive dialogue and debate techniques on a variety of cross-cutting issues. Debate club members will have the opportunity to learn and practice debating skills through workshops and practical debates. The program will last for 12 months and will be incorporated into a national competition at the conclusion. At the launch U.S. Embassy Public Affairs Officer Amanda Jacobsen stated, “This activity brings the art of debate and peaceful dialogue to support the country’s reform efforts.” Debate is essential to creating leaders. Participating in debate cultivates essential leadership and public speaking skills in young students, she added. The outcome of this program will help Ethiopia’s reform efforts of peaceful nation building by creating platforms for future leaders of Ethiopia through debate and dialogue. The National Debate Club is implemented by the Centre for Community Development (CefCoD), an Ethiopian Resident Charity Organization. One Response to "U.S. Embassy Launches Ethiopia Debates"
Good Idea. In my opinion, one of the most essential tools in the development in Africa. We Africans don’t know the inherent meaning of debate. To us, it is equivalent to arguing, insulting and eventually winning by ANY MEANS >>>including violence. That is how we do it, seemingly for time immemorial. Observe, the IDEA emanates from the US Embassy, NOT from Ethiopian Universities or any other sources inside the country. Sorry for being harsh. I can’t help it. It is in my ………….never mind.